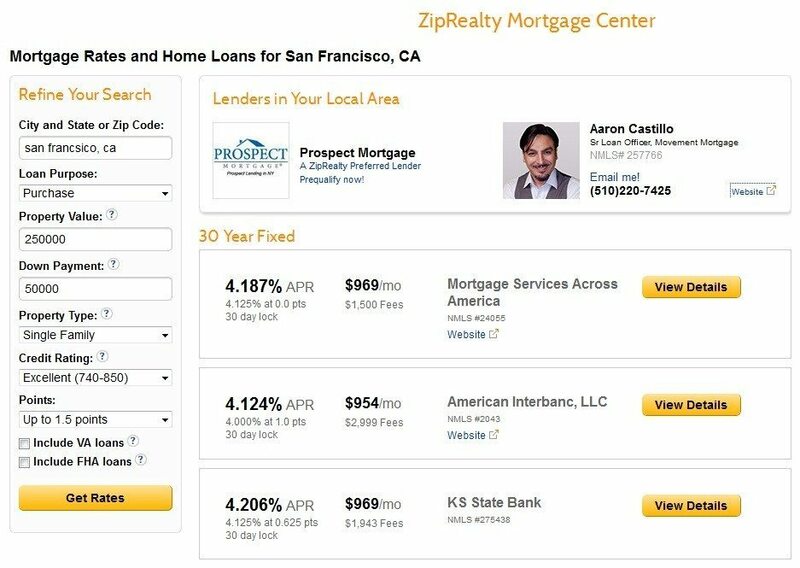 Real estate brokerage and referral site ZipRealty has expanded its technology offerings for brokers with the launch of a white-labeled version of its Powered by Zip “software as a service” platform. The platform is an “end-to-end” product offering brokerages several integrated tools, including an individually branded website, mobile website and mobile app; ZipRealty’s mobile-optimized “Zap” customer relationship management system; business and transaction management services; digital marketing for agents; and “agent coaching” reports that aim to help brokers identify training opportunities for their agents and boost their productivity using metrics such as lead response times. Brokers often have to cobble together several different systems to run their business, using one for lead generation, another for CRM, another for a website, another for a mobile app. By offering one product in which all of these tools talk to each other, ZipRealty’s Powered by Zip platform aims to allow brokers to focus on what they do best: sell real estate. “At the end of the day, real estate brokers got into the real estate business to serve consumers through real estate agents … not string together technology platforms,” Powered By Zip President Xavier Zang told Inman News. ZipRealty’s own brokerage operations run on the platform it is now offering to other brokers, Baker said. “We didn’t build our technology ever with the idea of doing what we’re doing right now — licensing it and offering it to other brokers. We did it to run our brokerage. What it yielded was a system that is really deeply integrated,” Baker said. “We’ve done 150,000 transactions through this thing. We know it works. It’s not unproven and it has all the pieces that you need [as a broker],” he said. Four brokerages have already signed on as subscribers to the platform: The Q Realty Inc. in Albuquerque, New Mexico; Coldwell Banker Vanguard in Jacksonville, Florida; Century 21 Premier Group in Minneapolis; and Prudential Utah Real Estate in Salt Lake City. The latter three are among the 20 brokerages currently participating in ZipRealty’s Powered by Zip referral network. Brokerages participating in the network typically pay a combination of a monthly subscription and transaction-based fee for a package that includes a co-branded website, online agent marketing, leads and the Zap brokerage operating system, including full agent functionality for managing client interaction, lead incubation and customer service. The company decided to offer these tools as part of a white-labeled platform based on customer feedback, Baker said. Customers wanted to be able to deploy Powered by Zip tools throughout their brokerage operations — not just to a few select agents — and they wanted an individually branded website and a flat-fee model. The white-labeled Powered by Zip platform does not include a referral fee component. Zang declined to divulge the monthly subscription fee for the platform but said that there would be a monthly fee that covers a certain number of agents. If a firm wants to sign up more agents, there will be an additional per-agent fee. The company also offers different prices depending on whether agents want full access to the Zap CRM. The “heart” of the new platform is the CRM’s “Zap Score,” ZipRealty said. The Zap Score uses a proprietary algorithm to analyze consumer activities on a brokerage’s website and mobile app to assign each consumer a score in order to help agents prioritize their work and deliver better service to consumers. 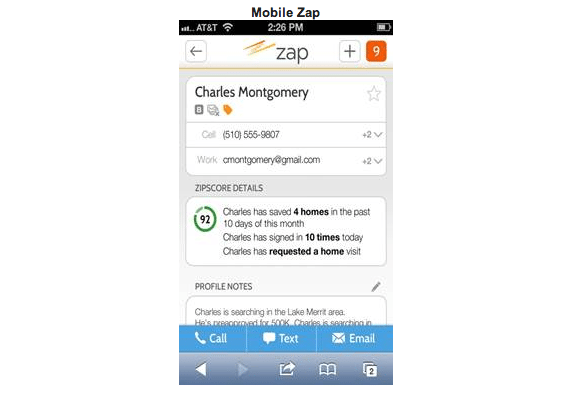 For instance, Zap will let an agent know when a customer is ready to schedule a home showing. 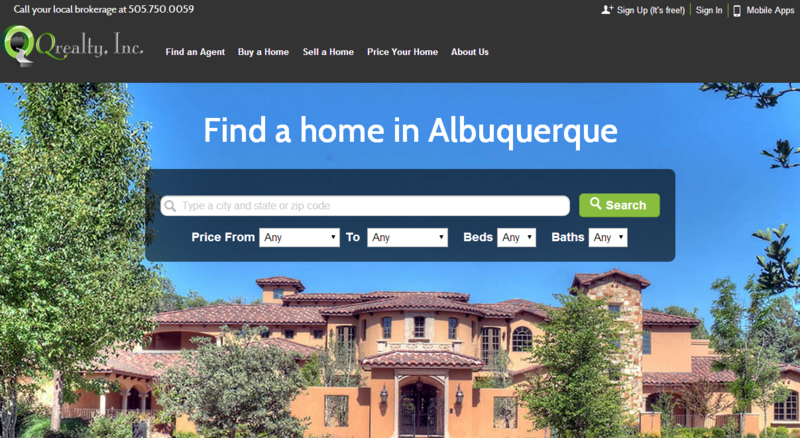 “Predictive lead scoring helps real estate agents engage with those consumers who are ready for service,” Zang said in a statement. CB Vanguard President Peter Dalton has told his agents that the platform will change the way they convert leads into actual deals. “This software is truly amazing because it will help you determine who your best leads are. You can pull all of your leads into the Zap CRM — on your desktop or mobile device — and incubate, and then keep tabs on them,” he said in a statement.